If there is a place that can compete with Brooklyn for title of capital of kids’ book illustration, it is definitely Western Massachusetts. The area is home not only to such talents as Barry Moser and Tony diTerlizzi but the Eric Carle Museum of Picture Book Art. If looking at original illustration art is not enough, you can go buy it at the R. Michelson Gallery, one of the best purveyors of the stuff in the country. On my visit there this weekend, I found myself wanting a Tomie dePaola, Strega Nona being one of Galatea’s favorite books of the past few weeks. Strega Nona is one of those books that I didn’t quite get when I first read it. The pictures and text are great, but they are just as great in Tomie’s other books too. I love the fact it is set in my ancestral homeland of Calabria, but I’m pretty sure that has nothing to do with it having become a classic. It wasn’t one of Gal’s early favorites, and I only came across it while moving some stuff the other day and decided to give it another shot. Right away, its genius became evident: it is about cooking and spaghetti, the favorite activity and food of many a toddler, including my own. My nephew William came along to help pack the audience, and I told him that I would buy him any book he wanted, so long as it wasn’t a Star Wars book, which greatly disappointed him. He chose instead the new Knuffle Bunny book, which seemed apt, as Mo Willems lives in the area as well. William is a major Mo Willems fan and loved Knuffle Bunny Free–as perfectly slick yet shaggy as Mo’s other work–but was puzzled by the ending. He found it entirely improbable that the girl would give away her favorite stuffed animal. (Hope I didn’t just spoil it for anyone.) “It just makes no sense, it makes no sense,” he repeated over and over, and said he would under no conditions EVER give away his own bunny. His older sister, Amelia, on the hand, thought it was a very fine ending, and it reminded me, as did Strega Nona, that books have different meanings at different times. My latest kids story is different from anything I’ve ever done. First, you won’t find it in bookstores, but on newsstands. Second, I haven’t done the drawings for it. In fact, there aren’t any drawings accompanying the text–there’s a fashion shoot. I was approached a few months ago by an editor at Lucky to do a story for the debut issue of Lucky Kids that would work as a stand-alone children’s book. The only direction I was given was that the tale be set in a redwood forest. The most challenging part of the assignment was that it used photos instead of illustrations. Galatea, like most kids, has loved photographs since she was a baby. There are lots of board books that use photos for illustrations (Gal’s favorite was an incredibly cheesy one from the eighties that has images of babies with lots of teeth smiling at the their mommies) but not that many kid’s books. The only ones I really knew of were William Wegman’s, where he dressed up his Wiemeraners as Little Red Riding Hood, Cinderella, and Santa Claus. I quickly learned of others, the classics being the Lonely Doll and the Little Red Balloon, based on the movie. Gal went for both books, but not the others I found. She does like the I Spy genre, but obviously just to hunt for objects, not to get into the characters or story. I’ve talked to other parents who say that at a certain age, around two, kids just start to prefer stuff that is drawn or animated. I wonder if that has more to do what children like, or the quality of the material being made. In any case, Liesl of the Woods is not a story for two-year-olds, but older kids, and their parents. 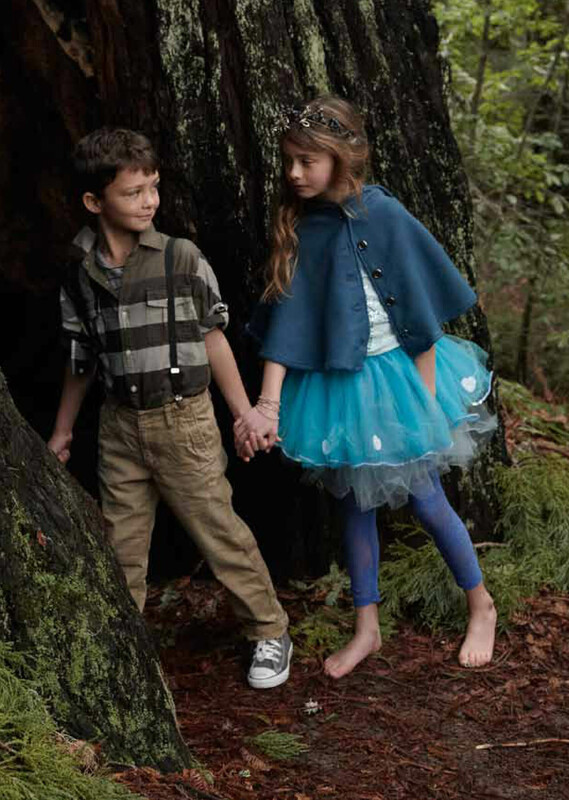 You can check it out in the magazine, or go to the Lucky Kids website and check out my reading of it (download here). Just back from vacation, if a ten-day span that included three twelve-hour-plus trips with a two year old can be considered vacation. The one thing all the time in trains and planes did, however, was give us a lot of time to read. With high hopes, I brought along the Nook ebook reader. The Nook is different from the Kindle in that the new one is in color, making it a legit medium for kids books. 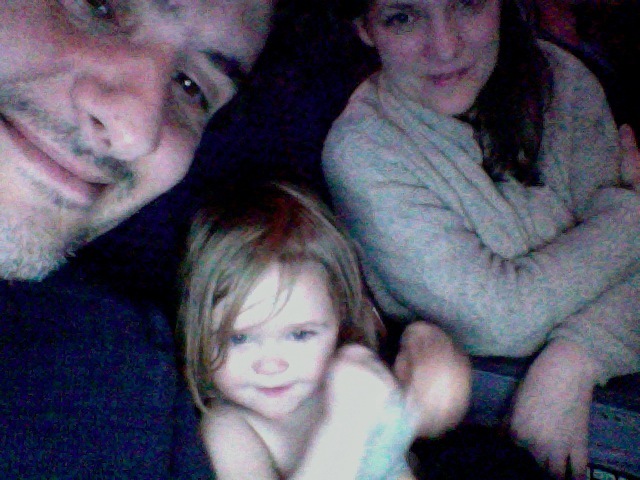 On the first plane ride, it was a definite success, helping to make a long flight bearable. For the most part, Gal wanted to flip the pages back and forth with her hand, or rather slide them, as that’s the way the Nook works. Oddly she didn’t want to read Corduroy, one of her favorite books offline, but wanted to keep seeing new titles. The one she liked best was definitely Fancy Nancy, there being a lot of fun objects in Robin Preiss Glasser’s drawings to zoom in on. Thankfully, we also brought some hardcovers along for the journey. Gal’s favorite was Peter Sis’s Madlenka, which I picked up at BookCourt shortly before we left. It came as a complete surprise to me that Galatea would like this book at all at her age–I had only bought it because I myself love the art, and I found out that Gal’s Czech babysitter is an old friend of Sis. Madlenka is a relentlessly inventive book, with some pages looking like game boards and others magical fantasy spreads, first seen only through die-cut windows. What grounds the reading/viewing experience is Madlenka herself, with her bright eyes and yellow umbrella and rainbows, which Galatea already relates to. Madlenka sometimes is so small she must be hunted down in the picture, which is always fun, and then on the game board pages, Gal loves turning the book to its side and upside down. Again, she’s interacting as much with an object as she is with the story, but the physical aspect of a big picture book is still immensely satisfying to her. What’s more, there is her knowledge and expectation of what a book is and what it does–she knows that there’s no way it’s going to start playing a Lady Gaga video, so she is able to enjoy it without worrying about what else it will do. A brief, belated note about Jazams, the wonderful toy and book store in Princeton. Princeton is my home stomping ground, more or less (I was born in the hospital there, and came back for high school). For a toy store, they are a heck of a book store. The family spent the better part of a week in an around Princeton while Andromache worked on a new production of Crimes of the Heart for the McCarter Theater. (Check out the review here.) We used Jazams as our home base, much to Galatea’s pleasure. I had begun to fret that plastic toys with lights and sounds were superior to plain old toys, but I now know that is definitively not the case. Here’s dedication: Becky from the kid’s department of Books & Books in Coral Gables has tattoos by Lane Smith, Eric Carle, and Mo Willems on her arm. Her right arm only, which is her drawing arm, and she wants to summon artistic power from the greats for her own work. On the gallery wall leading into the kid’s department is an excellent drawing she has done of many classic children’s book characters. The selection on the shelves shows the curatorial hand of people who know what they are talking about when it comes to picture books. I grabbed Oliver Jeffers’ The Great Paper Caper and hopped on a plane home. It was the first book Gal and I read this morning. It is a completely great book, one of those with clever touches that keep the parents loving the book while the kid is absorbed. Of course, Gal would love the book no matter what because it has an owl in it. She also loves the picture where the pig is going “piscia” against the tree. If you know Italian you don’t need to check out the book to know what I’m talking about. In any case, I have a new favorite kid’s book. 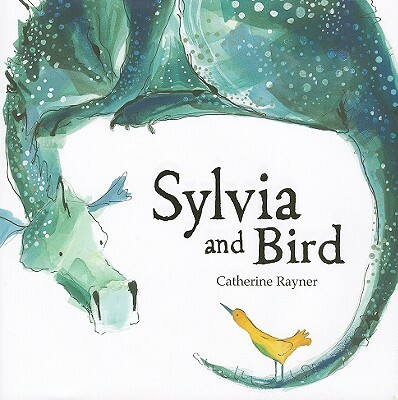 Sylvia and Bird was recommended to me by Emily, the children’s manager at Lemuria Books in Jackson, Mississippi. I’d never heard of the Scottish author-illustrator Catherine Rayner, and Emily explained that she’s a bit under the radar here, having published in the US with a small outfit, and only now moving onto a major publisher. Her ink line is expressive, and her watercolors unique. It seems like exactly the kind of book that Galatea is not ready for yet but her parents will love, as was the case with Kevin Waldron‘s Tiny Little Fly. (Andromache did manage to get Gal interested in chasing a fly, but the connection with the book itself is pretty tenuous.) Report on this book to come. Square Books is its own store chain, all in one place. All three branches of this unique store are a block apart on the square of Oxford, Mississippi. It’s hard for me to write anything without sounding like a press release for these guys, but frankly, I just can’t imagine a more ideal bookstore, or book town, as that’s what the three stores feel like. The main store is where you can be your most highbrow literary self; on the next block is the events space, from which they broadcast Thacker Mountain Radio; around the corner is the kids shop, where I was pleased to see a most excellent selection of Brooklyn folks prominently displayed (Peter Brown, Sean Qualls, Tad Hills, Oliver Jeffers, Sophie Blackall, to name a few). If you’ve ever dreamed of taking a vacation just to read, Oxford could be the place.